Lacto fermenting vegetables can be done quickly and easily using ingredients you most likely already have at home. See basic recipes for lactofermented foods below. In addition to lacto fermented vegetables, these probiotic-rich condiments are also called cultured vegetables. Cultured vegetables add not only probiotics, but also vitamin-rich vegetables, sour-salty flavor, and intense color to every meal. I don’t consider a meal complete unless it contains some sort of fermented food with live cultures, whether that’s milk kefir, high quality yogurt, kombucha, or fermented vegetables like those shown here. When I make lacto fermented vegetables, I like to do a big bunch at once. They are very simple to make, and odds and ends of each veggie can be combined at the end to make one jar of special mixed cultured vegetables, with a different flavor each time! Directions here make 2 quarts sauerkraut, 1 quart pickled ginger carrot sticks, 1 quart beet kvass/pickled beets, 1 quart salsa, and a pint of mixed veggies. * Not needed for this, but I always get questions about my continuous brew Kombucha crock in the picture above. It can be found here. It’s awesome. Cultured vegetables are very forgiving. I use less salt than Nourishing Traditions calls for, and my ferments are still great, just less salty. Don’t feel like you have to be perfect in this, it’s an art, and about finding what your family likes. 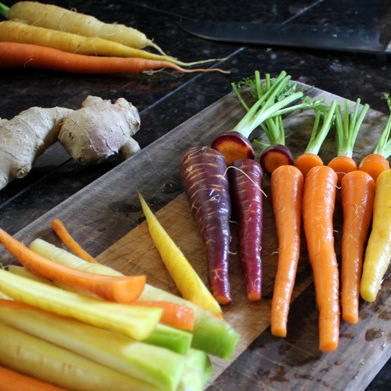 Scrub carrots, remove ends, cut into carrot sticks. Place in a quart jar. Add 1 tablespoon fresh ginger, peeled and diced or cut into thin rounds. Add 1 tablespoon coarse or fine sea salt. Fill to within 1 inch of the top with filtered water. Chop: Tomatoes, onion, cilantro, 1 clove garlic, pepper. Mix with 1 tablespoon sea salt. Pack into a jar (I layered mine since I think it’s pretty). 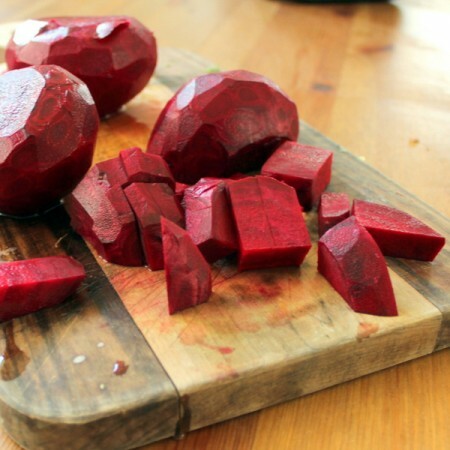 Peel and then coarsely chop beets into about 1/2 inch cubes, I’ve been told not to grate or dice them to prevent the kvass from becoming too alcoholic. Add 1 teaspoon sea salt to pint jars, 1 tablespoon to quart jars. Place whatever veggies didn’t fit in with your other jars into one more jar. Add 1 tablespoon of sea salt if a quart, 1 teaspoon if a pint. Fill to within one inch of the top with filtered water. Optional: Add 1 tablespoon of pickle juice from pre-made ferments. Screw on air-tight lid. 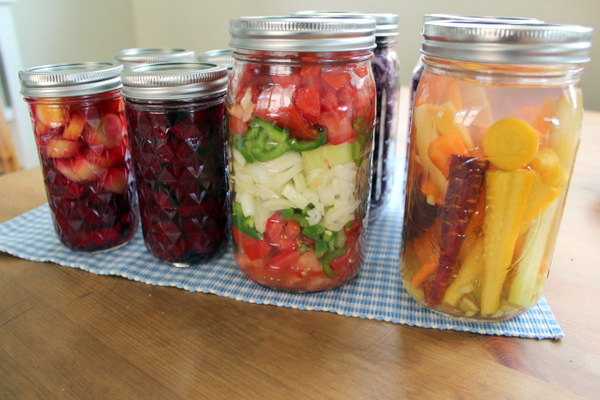 Allow ferments to sit at room temperature for desired length – the amount depends on the amount of sugar in the vegetable (beets and tomatoes are high), and the temperature of your house. I recommend 1-2 days for beet kvass and salsa, 10 or more days for cabbage and carrots, then transferring to the fridge. Probiotics are becoming better known now, even mainstream doctors are recommending yogurt with live active cultures, or a probiotic supplement, after a course of antibiotics. I see yogurt advertised on TV to help with digestion. These fermented vegetables are full of probiotics, which not only preserve the veggies, but also break down some of the fiber to make the vitamins more easily assimilated, and provide more varieties of friendly bacteria for your health. Many are starting to question the overuse of antibacterial soaps and too many prescriptions for antibiotics. Too many antibiotics, toxins, and antibacterial products can cause a gut to be leaky. A leaky gut can cause all kinds of health problems, from eczema to mental difficulties, chronic conditions like fibromyalgia, and even food allergies. To learn more about the leaky gut, and what you can do to fix it, click here to sign up for a free webinar with me and the Solving Leaky Gut team. Thank you! I’ve been thinking about trying fermented veggies for one of my children… but with 6 kids, tackling new projects can seem so overwhelming! This looks so quick and easy!! If you do not add the pickle juice then what actually causes them to ferment? I thought you had to have some type of starter to allow the fermentation process to happen? Hi Amy, you don’t – the process is explained here. Thanks! So I made a batch of beets and carrots at the same time. The carrots have tons of bubbles and have softened and are sour. The beets which you said usually happen quicker are don’t have much sour smell or taste to them. Should I just leave them out longer? It has been 4 days for both. Beets don’t always bubble, did they not soften at all? Yes, I’d leave them out a while longer if they’re not soft. Great post however I have never fermented anything before so how do I start? Where do I get the fermenting juice to add to the batch? You can do it without the starter juice, or you can buy Bubbies brand pickles or kraut, it’s usually in most health food stores, in the refrigerated section. I took these same steps when I tried my own fermented veggies for the first time from the recipes in your GAPS 30 day intro book. They all ended up totally rancid by the time I opened the jars. Any tips? 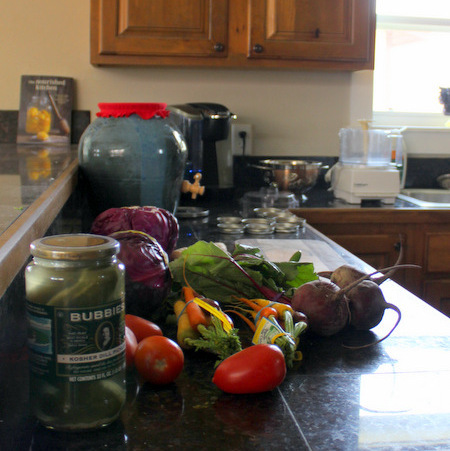 Have you had fermented vegetables from the store before? They taste a little ‘spritzy’, but they shouldn’t have had mold or anything, can you describe them more and maybe we can figure it out? I have had fermented veggies from the store. They do have a fresh and spritzy flavor. When I make them and open the jar after the alloted time they are not moldy but smell rancid and spoiled. I’ve heard some people put some kind of weight on the top to keep the veggies under the water. Is the issue that a few pieces of veggies stick out of the water and this causes them to go bad? I have had store bought fermented veggies. They are spritzy and fresh. When I open my ferment jars they are rancid and stinky. I can’t even get my face up to it. Have bad bacteria taken over the good? I’ve read that some people put some kind of weight on the top of the veggies before closing. Is the issue that a few pieces of cabbage stick out of the water? Yeah, they shouldn’t be like that, sour is good, or even smelling slight alcoholic is fine. The cabbage should be totally under water, I bet that was the issue. AHH!! This is SOO helpful :) I may just go out and do this right away tomorrow. Do you recommend a culture starter such as the one sold by Body Ecology? I have a little bit of the “fear factor” to get over and want to do it right the first time so I don’t have to throw anything out. Thanks so much! I always thought that whey had to be used to ferment vegetables (as Sally Fallon describes in her book Nourishing Traditions). If fermenting can be done with just salt, then what is the purpose of using whey? It has starter cultures in it, I’m using pickle juice instead here. In Nourishing Traditions Sally says to use double the salt if you’re omitting whey, but I find that makes the veggies way too salty for us, and I experimented with using less while we were dairy free. I would also like to know if the salt version be the same as using whey. I have only used salt to make cultured veggies, and especially is a little too salty for making beet Kvass even just using 1 tbl. per quart jar. Hi. Great post! I just made the beets recipe and was wondering, how do you know when it’s done? I know you said 2 days but are there any indicators that it’s done? I’ve never done this before but have always wanted to ferment my own veggies. Thanks again for the great info! 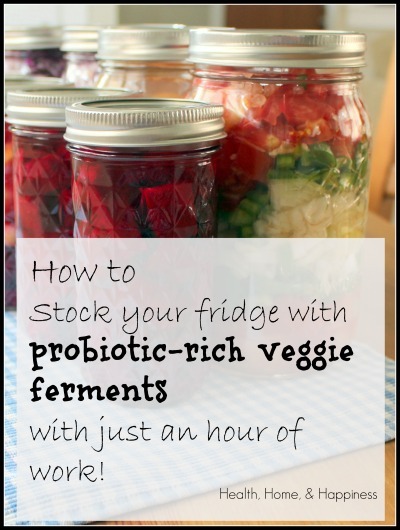 Hi, this is a great DIY for fermented veggies. I have found that you must be sure that all your tools and jars be sterile and all the veggies super washed and clean. If there is any kind of contamination, the jars will spoil. I leave lids off also, and put a new piece of nylon hose (knee highs) over the top of jar to keep stuff out along with a ziplok bag filled with water down in the mouth of the jar to keep everything under the brine. Great tip with the water filled bag holding veggies down under the water. Floating veggies always seem to be a problem for me. How do you know when the beets are ready.? You leave them out for 2 days and then how long in the refrigerator til they are ready? I use BLIS K12 probiotic, great probiotic from New Zealand. The http://blis.co.nz explains that BLIS K12 is for the mouth, first line of defense in the mouth. Mouth is the gateway for harmful organisms that causes lot of illnesses. Hello, this looks so easy. But i a have a couple of questions, ( I should say a ton of questions, :-) ), i hope you could help me. Do i need to sterilize my jars to ferment?, Do i need to loose the caps frequently, or just let them sit at my counter?. I am totally new in this process, so i am a little bit scare. I just bougth a case of pint mason jars and i do not know how to star lol. Thanks. You and your blog are really helping me in the process. Today I decided to try some of these and am so excited to see how they turn out! I do have a question…I have made the Italian vegies before and saved the liquid from the last batch. Do I add any salt to the liquid if I’m using that liquid? Also, I decided to try using the liquid I saved from a jar of Bubbies dill pickles for one batch of italian vegies…same question, any salt needed for that batch? Thank you so much! Hi Billie, I would add some salt but maybe not the whole amount. Usually I just use a tablespoon or so to start a new batch, not all the liquid. One more question…after letting my Italian veggies set on the countertop for 5 days, I opened the lid to check them before putting them in the fridge. There is some white mold on the very top (vegs that weren’t under the liquid…). I removed it but am now wondering if I need to toss the whole jar? Thank you so much for your help! Was it mold do you think or just foam? If it’s mold I throw it out, if it’s thick kind of goopy foam it’s fine. Hi Donna, I’ve lived in Arizona so I understand :) I would cut the ferment times way down to 24 hours. It’ll mostly be personal preference- if you like your ferments softer and tangier, increase the time. For more mild and crunchier ferments, use less time. Can I use purified or distilled water? Would kombucha be ok to use as a starter culture? I use kombucha to do my apple chutney, but I usually use pickle juice (Bubbie’s brand) in my savory ferments. We LOVE these fermented pickles and I want to make lots more BUT I have a question. Is there any way of storing them safely on the shelf? 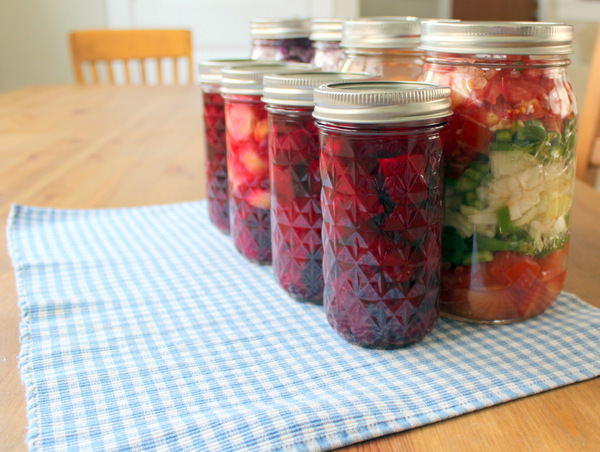 Fermented & pickled vegetables used to be the way of storing the harvest in the days before the refrigerator. All the recipes, including yours, say pickle / ferment for a few days and then store in the refrigerator. I assume that this is to stop the pickling process. How did they used to stop the pickling process 200 years ago? There must be a way to do it so that I can continue pickling vegetables without running out of cold storage space. I hope you can help. Hi Katherine, great question! If you have a cool ‘root cellar’ or crawl space you could keep them there. That’s what they did before refrigeration. Under ground is best, you don’t want them to freeze or get too hot. You’re right, they will keep fermenting (and possibly dissolve) the longer you keep them at room temp. You can also use a big ceramic fermenting crock to assist in keeping the temperature cool. Yes, would love to learn about this!